This blog is about Seagate’s World, the people and scenery in this very picturesque region where Seagate’s factory is based, which is actually in Ensenada, Baja California … not Tijuana. In order to reach Ensenada by road, a beautiful seaside community along the Pacific coast 100 miles south of San Diego, you must first pass through Tijuana. Although it is not necessarily a favorite place to visit, nor safe place to stop for gas, Tijuana is still a part of our world. Twenty five years ago, the City fathers of Tijuana decided to move the red light district away from the tourist border crossing, so that the first impression of the tourists walking across with their kids, cameras, Bermuda shorts, black socks, and grandma was not of bars and brothels. They succeeded in moving these businesses one mile away from the San Ysidro crossing, but really not far enough. The photo above shows the ever-present Tijuana taxi and no, this is not a woman showing off the summer wardrobe from J.C. Penny’s. 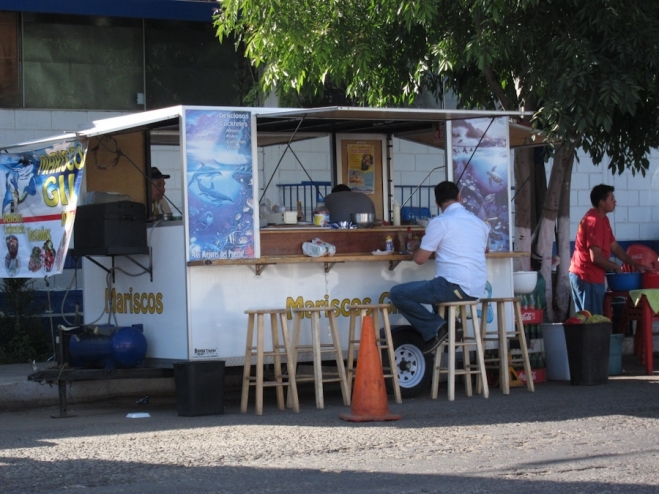 If you can navigate along the streets pockmarked with potholes that can swallow your radial tires as you go zigzaging at 5 miles per hour to avoid the largest holes, you will pass the ubiquitous taco stand. They appear everywhere and are a very important part of the local food scene. The carne asada (charcoal-broiled) tacos are the finest-tasting in the world, though somewhat risky if you have a susceptibility to salmonella and other life-forms that like to grow on meat that has not been refrigerated for most of the day. 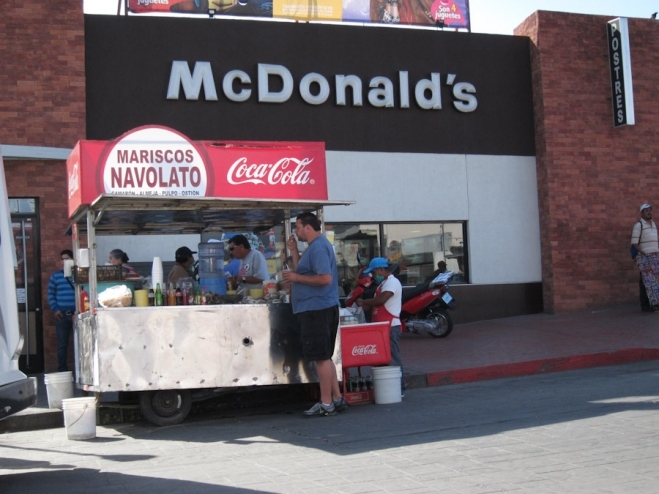 On occasion, the two cultures clash and then blend, when a taco stand operates in front of McDonalds, the icon of U.S. culinary treats, while advertising the availability of Coca Cola. However, if you keep your windows open, the smell of the charcoaled meat permeates every street and lures you to measure the risks of succumbing to some of the finest-tasting tacos in the world. The main commercial zones are dominated by small stores, selling everything from sombreros to carved wood sculptures, which many tourists purchase to add to the storage boxes in their attics. Sometimes the lure of bargaining for a lower price with a little too much afternoon sun and money in your pockets can make the few remaining tourists part with some cash. Unfortunately, for the last 10 years the number of tourists venturing into Tijuana has slowed way down to a trickle. Several different Mexican drug cartels have fought for control of Tijuana because it is the west coast gateway for drug-traffic into the U.S. At the moment, there is relative peace with kidnappings, beheadings, extortion, carjackings, and highway robberies down in this part of Mexico as the Mexican Army has shown a greater presence on the streets and at highway checkpoints and because one cartel seems to have taken over control. Five years ago the entire Tijuana police force was (temporarily) stripped of all their guns by the army for several weeks as they tried to root out police ties to organized crime. Since July 15, 2010 the U.S. Mission (a.k.a. The State Department) imposed restrictions on all their employees, no longer allowing them to drive for personal reasons or with their families from the U.S.-Mexican border to the interior of Mexico. This border region is also attractive to terrorism. In 2010, Mexican Federal investigators broke up a local Hezbollah terrorist cell with ties to Lebanon. Tijuana suffers from the normal corruption problems of (some) elected and appointed officials, also from the recent new industry in human-trafficking. Many middle-class and wealthy shopkeepers and professionals have moved their families into the safer neighborhoods of San Diego in order to avoid the dangers. However, the random energy and commerce of Tijuana still manage to continue. The above street picture shows the heart of downtown Tijuana where a red light (meaning the traffic light, not red light district) means everyone can cross the street even on the diagonals. After finishing a day of shopping in Tijuana, the American tourist is faced with a typical 2-hour wait in line at U.S. Customs where you and grandma may be surprised to be treated as potential terrorists, drug-smugglers, or illegal aliens in case you forgot to bring your original passport on this visit. While you may be subject to intense inspection, 15 miles inland from this port of entry, where the border fence disappears, tens of thousands of “undocumented” immigrants representing potential future voters for some of our U.S. politicians, are able to cross into the U.S. each month, mostly undeterred by the few border patrol vehicles covering the U.S.’s 2,000 mile southern border with Mexico. Seagate’s factory, farming, and fishing operations are based in Ensenada, Baja California which is 65 miles south of Tijuana. Many of the tourists still brave enough to venture south, tend to stay on the main roads and pass through Tijuana as quickly as possible in order to reach Ensenada. However, by doing so, they avoid the sights, sounds and smells that make this town an exciting and very unique place to visit. The underwater picture of-the-week is of a moray eel. Many different eel species inhabit the local waters. They live in crevasses, are very territorial and can appear ferocious when they feel threatened. They have very sharp teeth and a strong bite, but seldom attack divers unless provoked. They wait in their holes for an unlucky fish, lobster or octopus to swim by to provide a tasty meal. The fellow above did not like the intrusion of our photographer trying to get a close-up shot. Sharon Miller - As ever, your pictures are beautiful. Way to go Richard. © 2019 Seagate World|ProPhoto Photography Template by NetRivet, Inc.